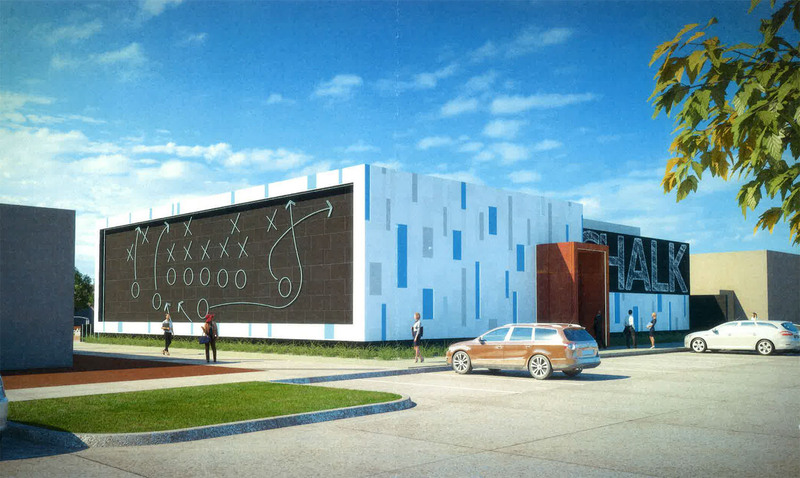 Chalk will feature an impressive million dollar plus audio-video system which will include 80+ screens, including one measuring 9' x 16' and several in the 7' x 13' range. 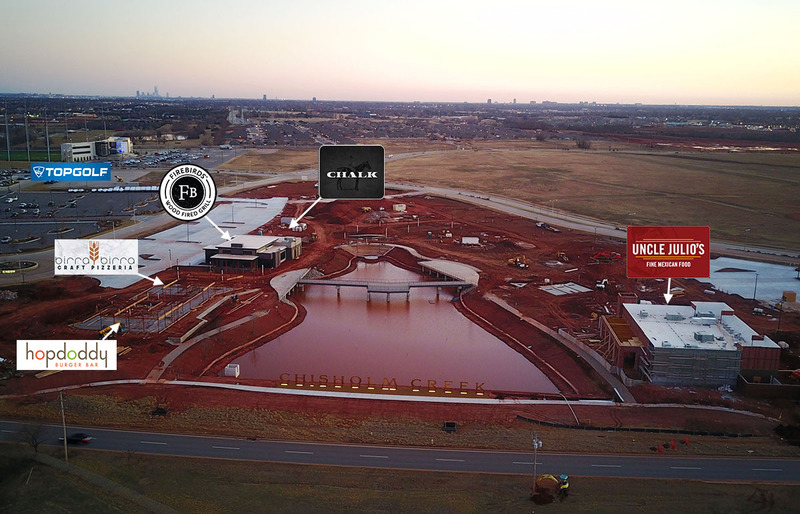 Chalk hopes to break ground in about 6 months at The Pointe in Chisholm Creek and join Oklahoma's first Uncle Julio's which is set to open in May, Firebirds Wood Fired Grill aiming for a July opening and later this year Hopdoddy and Birra Birra will also open. Been saying for years OKC needs places like this. Can't believe no one has done it yet. Pete, you and Jeff doing the A/V for them? This looks awesome, and will fill a huge void. Can't wait to visit later this year when I'm back for a visit, assuming it gets done in time. 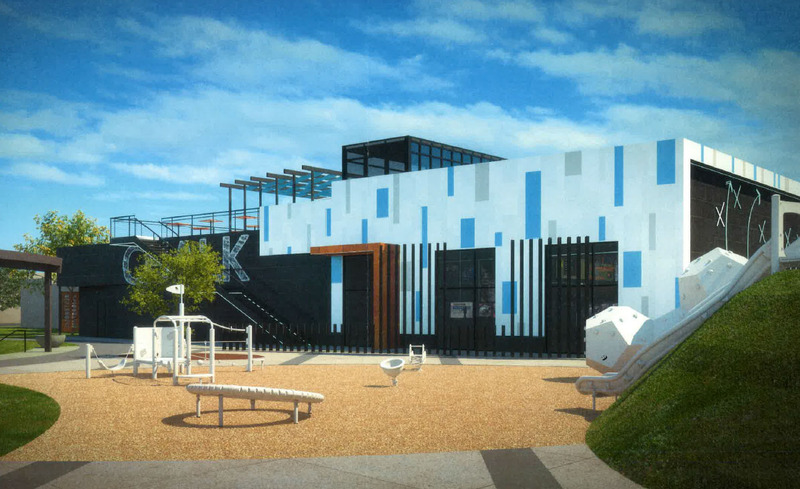 Been saying for years OKC needs places like this. Can't believe no one has done it yet DOWNTOWN. 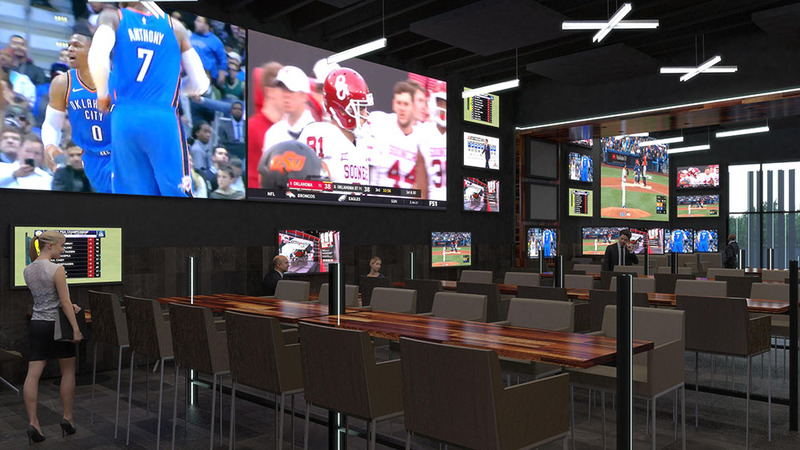 There are several options for sports watching along Memorial, Republic, Twin Peaks, Hooters, Pub W but downtown is still sorely lacking a good sports bar. How does the A/V investment compare to Republic? And all are lousy IMO, especially compared to something like this. I've been to them all. 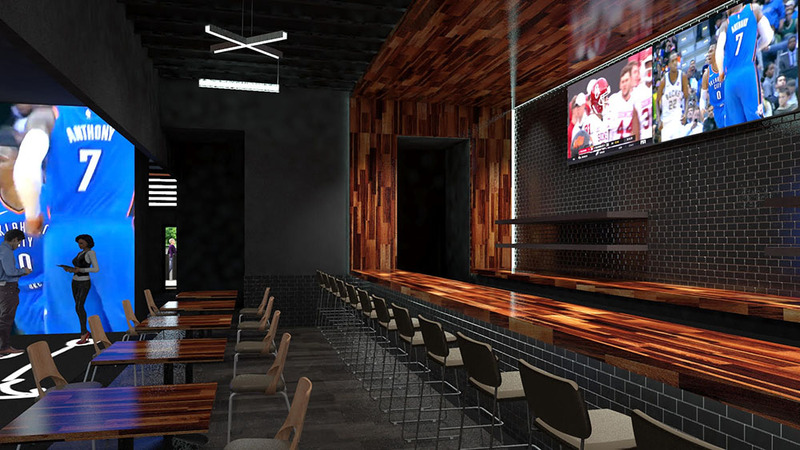 downtown is still sorely lacking a good sports bar. Since you brought up the ones on Memorial, I will mention HeyDay, Henry Hudsons, Urban Jonnies, The Garage.. Even the Jones has a good number of screens inside and out. I can't fully agree with this. Republic is awesome! The rest, yes, are meh. But to lump Republic with them is not fair. 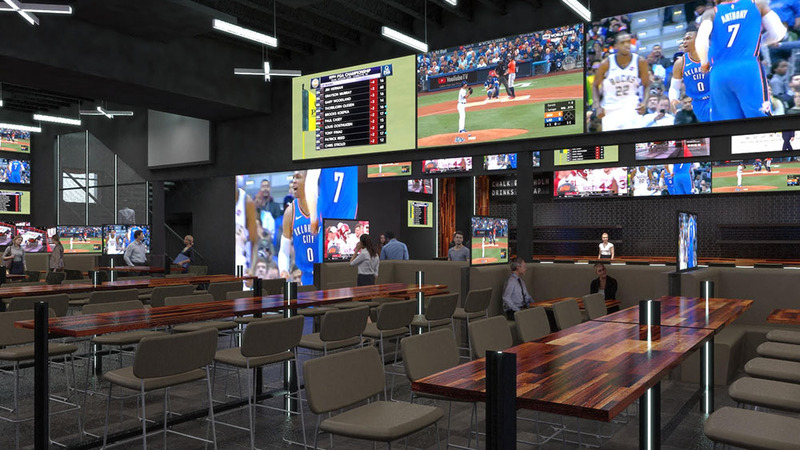 Republic is great but absolutely not a sports bar, especially the Memorial location. Okay I'll just say it because I think it constantly, especially with every new announcement. Chisholm Creek is stunting the growth and diversity in other districts, specifically downtown/midtown. I know there is many duplicate establishments in CC, but the result still stands. I am definitely going down a slippery slope, but I personally feel that CC will not only continue to hurt downtown - I think it will impact the Streetcar's success as well. I am fully envious of CC and I am actually hoping the investors clearing the Producers Co Op site have an urban version of this with residential in the plans. But I do fear it could be too late. Edmond residents now just have to drive (their favorite thing to do) to the Turnpike and not even think of going down I-235. Not sure I fully agree with this. Suburban OKC has needed something like this for a long time. If anything, I think it's going to hurt a lot of parcel chain bar/restaurants lining Memorial more than it will downtown. Of course Charlotte is much larger than OKC but its downtown is very vibrant yet there are multiple successful suburban entertainment districts. I do agree about the Producers Co-op. I am currently quite nervous about it becoming Lower Bricktown Part Deux. Urban sprawl has always been issue the inner core has dealt with. It takes something really special to get people from Edmond to come down there. I live on the north side of Memorial/Penn and I hate going up into northern Edmond. I'm sure they feel the same about travelling south. Is this the same Chad Ford that works at Payrock? I think a lot about this type of thing, so I understand your thought process. But in this case I think it's different markets. The Chisholm Creek crowd will be the 30 and 40-something middle managers with money in Quail Creek/Val Verde, west Edmond and points north and east. And the apartment dwellers along Memorial. The Downtown/Midtown/Bricktown areas are, special circumstances notwithstanding, the slightly younger, hipper, more progressive folks from Nichols Hills south. Less of a chain-like" mentality. Let's face it, Chisholm Creek is nice but this still feels like "upscale chain" stuff to me. Just my opinion. I really do think that OKC, as it approaches and then blows past 1.5 million people, can support both. St. Louis, with 3 million people, probably has a half-dozen, at least, pockets of this kind of thing. I think we all make mistaken assumptions about who’s who in our districts of choice, and we project our values and wishes onto them. “Bubble” people - I’m definitely one of these myself - come to Bricktown and all they see is tourists, when the reality is that district probably still sees about 70-80% of its business from the metro. And the same bubble people sit down at The Mule or The Pump and they assume everyone walked there. There’s a reason they are knocking down surrounding housing and building paid surface parking lots, and it ain’t for people who live in Gatewood and CTP. Next time you’re standing in line at Sunnyside or Waffle Champion, or the next time you’re on a barstool at R&J or shopping at Plenty, ask the people around you where they are from. I do this all of the time, not even kidding. I think most people would be VERY surprised by the results of this experiment. I also regularly talk to owners/operators of businesses in the bubble and they confirm the same, assuming they themselves bother to ask their customers where they are coming from (many don’t). The ultimate neighborhood indie retail project - Holiday Pop-Ups in Midtown - SEEMS like a bubble-only event, but the customers who make it wor don’t live in Mesta. They live in Edmond. Places like Shop Good and Plenty get TONS of suburban business and out of town business. So does Empire. So does Goro. It’s a healthy thing to question and evaluate your own perceptions. And for the record I am directing all of this at people in general, not a specific poster. We really are lacking in places that serve beer and have large TVs. I'm liking this development. I live in the far NW OKC / Deer Creek area and our dining and shopping go-to location is this area and west on Memorial. Anything that keeps me from having to go downtown makes me happy. Like most, I have a ton of friends and family that live in North OKC and Edmond and even though they come to the core frequently, sometimes it's only fair I meet then at least halfway. We end up Sidecar CC a lot because there are very few bars out there and sometimes Pub W if we want to watch a game. However, I've pretty much written off Twin Peaks and most the other places out there. This is very needed and will absolutely kill it out there. Yeah, I like Pub W or The Garage to eat, have a few beers and watch a game. Tried Republic a couple times, and while the food was good, it's not really set up for good viewing. I haven't tried Sidecar yet. I'll have to give it a shot soon. Chalk looks very promising. Sidecar is not set up for viewing games but I really like the place and the drinks. I was just looking at their website and realized this. Still, it looks like a good place to hang out with a good scotch selection. I like the rooftop area. That Sidecar gets absolutely slammed on nice days. Yeah I lived up there my first three years back in OKC and going downtown to go to bars was a pain. I couldn't have much to drink due to how far I had to drive and Ubering from that far was expensive. This is why I don't think Chisholm Creek will hurt downtown that much. It caters to a slightly different market than Midtown/Plaza establishments do. Plus, as others have stated, Chisholm Creek caters to a slightly older crowd than downtown does. So the sports betting ban was struck down today. If I’m chalk I’m hiring lobbyists to get the laws in OK written so I can add a sports book to this. Chalk boards or dry erase boards?